Please wait as the page is being reloaded with new Building details. Please enter the 9 digit StrataPay Reference Number found at the top right of your StrataPay Slip, then click on 'Quick Pay' to proceed with your payment. NOTE: No login is required to make payment via Quick Pay. Don't have an Account but have a StrataMax ID? 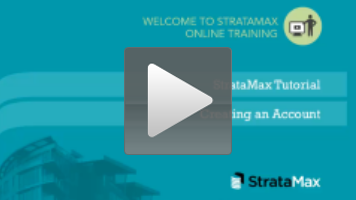 You need to create a new User Account to sign into the StrataMax Online Portal. This video will help you get started! If you previously signed in with your 8 digit StrataMax ID or your StrataMax Passport ID, you now need to upgrade your account. You can view reports and documents using the Online Portal. You can change your contact details under the My Info section. The Online Portal allows you to see and pay your exact outstanding balance. You can make payments using credit card via the Quick Pay or Payments pages. You can add multiple properties to a single login using the Link Property feature under My Properties.